So, I’ve got to get this RSS feed problem worked out. Loads of people are reporting problems, and I think its to do with the feed URL, and my brief flirtation with feedburner. Could everyone who is having problems make sure that the URL is https://www.hicksdesign.co.uk/feeds/rss/, and let me know if that fixes it? I have to come out and agree with Jeremy, Mac OS X 10.4 Tiger is a little underwhelming. I’ve been using it for 8 weeks now, and overall, I’m not as wowed as I was with the Jaguar>Panther upgrade. Sure, there are a lot of improvements, but I’ve not found a use for Dashboard and Spotlight, the supposed major features. I’m still missing uControl’s virtual scrolling, and haven’t found any suitable replacement. Thats a sore point. Dashboard takes a while to ‘kick in’, as you watch the widgets load slowly. I think this is still yet to reveal its usefulness, as a lot of widgets are things like ‘Amazon Search’. Hmm, referrer fees are wonderful thing aren’t they? Even the Transmit widget isn’t that useful. Why use that when I can just drag files to a dock or finder sidebar icon? It also seems to use up CPU unnecessarily, and since turning it off with DashOnOff on my powerbook is improved. Those widgets that I actually use (Calculator and currency converter) I have bookmarked in Safari, and open them in a tab. (To do this, ctrl-click the widget, and open the main .html file found inside). To be honest, I still prefer my neat little Stattoo. Spotlight is nowhere near as quick to use as Quicksilver (although, to be fair, I find the fact that it indexes text in PDFs quite useful). The jumpiness of its search results are annoying to say the least. I think there are sleepy features that will reveal their usefulness over time, such as Automator, but until then, the one thing that has made me glad to upgrade is Safari 2. Not only for its new features (little things like undos in textareas), but for its RSS Reader. I had very low expectations for the in-built RSS reader, despite really wanting a browser+RSS solution. I’ve now found myself using it all the time. Its convenient, feeds are synced along with my bookmarks, and it suits my style of reading perfectly. I always prefer to view the actual content in the browser, using RSS readers as little more than a notification of updates. It also seems to cope well the 250+ feeds that I subscribe to – no speed problems at all. Admitting this makes me feel very guilty though, as if I’m personally betraying Brent Simmons and David Watanabe. I’ve had a few questions about how I use the RSS feature, so I thought I’d just quickly outline what I do. In my bookmarks toolbar is an ‘RSS Feeds’ folder, in which there are sub-folders for ‘Mac’, ‘Music’, ‘Design’ and so on. This means that each sub folder has a ‘View all RSS articles’ command at the bottom its menu, which means I can view feeds together, or just in 1 category. New feeds are set to be coloured red, and sorted by ‘new’. Finally, I’ve hacked the appearance to be little less vanilla. I love the fact that that I can do it all within the browser. In fact, there is only one drawback I’ve come across. Sometimes it takes two goes to get the RSS feeds displayed. Click ‘View all RSS Articles’ once – nothing. Go back and do it again, it works fine. I’ve also seen this happen on individual feeds, but there doesn’t seem to be any reason or reproducible steps to it. Has anyone else found this? Its odd, but I find that I can put up with this (and hopefully its a bug that’ll be fixed in the future). One ‘archive and install’ later, and I’m now running on 10.4. This is just a quick post to offload the Tiger related thoughts in my head to make room for more important matters. Overall it seems very snappy. I’m not sure if this is due to a fresh install, but it feels very responsive and peppy – hooray! Jeff Croft found this too. One of the best features of Safari RSS, which no one seems to have mentioned yet, is the way it handles pages it can’t find. No longer do you get a sheet which you have to ‘OK’. Just a error message displayed in the browser window – just like every other browser, and its so much less irritating for it. Safari’s in-built RSS reader is actually much better than I expected. It now occupies a tab, rather than using the separate, overlayed window that was shown in the preview demonstrations. Great for small amounts of feeds, but lacks features such as mark as read/unread functions to make it practical. NewsFire is faster again, and it doesn’t suffer from the constant crashing that 10.3.9 was causing it to do. I’m torn between this and NetNewsWire yet again, and NewsFire is winning at the moment. I love being able to add the ‘unified toolbar’ look to Omniweb (using Interface Builder), without resorting to shapeshifter themes. I guess this has the potential to be overused in future apps, but personally I love this clean, less anaemic, look. Mail’s new toolbar icons. What were Apple thinking? To be able to use signatures in Mail, they have to drag and dropped onto the relevant account icon in the signatures preferences. Trouble is, no accounts were showing up, and the only way to get to show up was to remove them all and add them again. I really miss uControl. So far, its the only app I’ve found that either doesn’t work or hasn’t been updated for Tiger. If anyone knows of a similiar app (Sidetrack isn’t quite the same thing), that uses a keystroke and mouse movement to emulate a scrollwheel – I’d love to know about it. Dashboard is slow to startup, but once you let all your widgets load, switching to it is real quick. When opening a new safari window, the focus used to go straight to the location bar, not any more. Grrr! – not anymore – strangeness! Word hinting that I used every day in Safari (alt-escape after typing a few letters) is no more. Does anyone know the new key combo?” – again, back to normal, more strangeness! Just what the world doesn’t need right now – yet another spotlight style for NetNewsWire! There are many fine ones already available on the interweb, but none of them were quite how I wanted them to be, so here’s mine. I couldn’t think what else to call it, so for the moment its an egotistical self-named style. Any suggestions? If you’d like to give it a spin, download the style here: hicksdesign.nnwstyle.zip, and double click the file to install it (thanks to Jason in the comments for pointing out this easy install route). Please Note, you must have the beta of NNW 2 of NNW 2 Lite for this to work. User stylesheets are not supported in earlier versions. It would easy to to think that Firefox is the only browser with cool extensions, and overlook the excellent ones available for Safari, such as Saft, Stand and PithHelmet. Why bother skinning a site? Actually, there is a purpose of sorts. Lets say for example that you’re a heavy Gmail user, but you’d like the interface to look a little less PC. With a site skin you could alter it to look more OS X. So here’s the one I’ve been working on. A Spotlight-ish skin for de.licio.us. The start of this idea came from Tom Coates mockups of bookmark tagging inside Safari. My aim was to make de.licio.us look more like a part of my browser, rather than a web page. If you’d like to give it a go, download this site rule (ctrl-click and ‘Save linked file as’), and then drag and drop it into PithHelmets site preferences window. That should be all you have to do, but this is a ‘first try’, so do let me know if anything goes wrong. open up PithHelmet menu>Show Site Preferences. If you haven’t already set preferences for that site, it will be at the bottom of the list. themename/newlogo.png (You can leave the ~, as this will choose the current users home directory, and allow the theme to be used by others). If it all looks OK, drag and drop the theme onto the finder, and this will create the .phr file with all the theme information. The ability to create an easily sharable site theme opens up possibilities. Sites like de.licio.us are perhaps a little easier than some to theme, as all the styling is done with external css. So, who’d like to have a go? My previous modifications to the Firefox Toolbar have one problem. Certain extensions’ toolbar icons become borked. This is due to forcing a css priority, unintentionally overriding css rules for these icons. Update – For various reasons I’ve decided to keep going with my Textpattern version, but the information is here if you need it. Word of warning though – make sure you know what you’re doing with the cache. I’ve just moved my sidenotes links from the inbuilt textpattern system to de.licio.us, a service I’ve been using more and more over the last couple of months. There was nothing wrong with the Textpattern method, its just that using de.licio.us makes these links a little easier to find again. Now I post my sidenotes using Cocoalicious, a beautfully simple cocoa interface to the de.licio.us api. If the site I want to post is in Safari, I just select ‘New post from Safari’ in Cocoalicious, and it pre-populates the fields. Each tag in de.licio.us can have its own RSS feed, so all that was left was how to integrate the links on my journal pages. Started adding links with the tag ‘notes’, making sure that I added a wee description at the same time. Uploaded the Magpie RSS Parser to my server, adding a sub-folder called ‘cache’. By default, Magpie will cache the rss feed (if you’ve setup a cache folder) for an hour, so the de.licio.us server doesn’t get hit at every page load. Uploaded a new php file with Richard Erikssons’ code. All I had to add was the correct username (in this case, adding /notes/ on after that), and ensuring the path to the Magpie parser was right. include the php file into journal pages. job done. I’ve had a few rasied eyebrows about the fact that I illustrated the Firefox icon, and I’m ‘not using the damn thing’. I’ve tried, believe me I’ve tried to like Firefox, but it still jars against me the way its so un-native. It looks great (thanks to Kevin and Stephen), but doesn’t act or feel like an OS X app. The grey opaque menus, little behavioural quirks, lack of interaction with the services menu, non-native widgets, no spell checking. It does allow you multiple undos in textareas though, which is a plus. Maybe the Mac Aquafication release will solve some of these issues (whenever that comes out…). I love the idea of combining an RSS Reader with a browser, it makes sense to me (unlike, say, bundling a browser with an email client). I’d tried other solutions, such as Feed on Feeds, but stopped using it fairly quickly. It didn’t work well as a sidebar bookmark, and would often time out on the second feed. 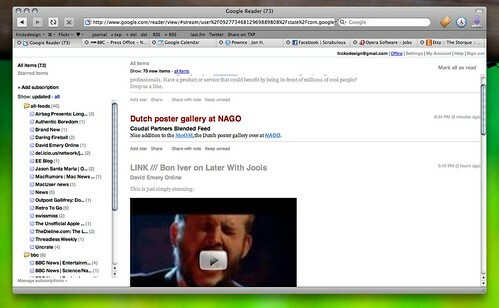 This is where Sage comes in, an RSS Reader thats designed to be used in the sidebar. Feeds seem display to fast enough, and the interface even gives you the option to choose your own CSS for the feeds display, via the settings options. Adding feeds is very easy, find a site you like, and Sage’s autodiscovery will list all the available feeds in a drop-down sheet. Future versions of Sage plan to integrate with the recent Live Bookmarks feature. The other advantage is that if you use something like the FTP Bookmarks Sync extension, its easy to keep your list of feeds synchronised across machines, as all your feed URLs are stored in your bookmarks. One small suggestion I have is to remove the icon for ‘no updated feed’. Normally Sage would display an icon next to every feed, but removing this one will make it much clearer what is and isn’t updated, and which is returning errors. This is what I’ve done on my copy and you can see this in the screenshot above. So far, Sage is the only thing that’s tempting me away from my favourite Omniweb 5 and NewsFire combination (which is just superb). I’m still not sure if it will replace it entirely, but at the end of the day, I just enjoy playing and fiddling. Locate your Firefox profile folder: UserName >Library/Application Support/Firefox/Profiles/xxxxxxx/chrome/ folder. Copy and paste the contents of ‘Add to userChrome.css’ to the userChrome.css file. If you’re using my mods for the toolbar icons, you must paste the sage css code somewhere after that. Copy the ‘sage’ folder to the chrome directory. There seems to be more choice of RSS readers for OS X than browsers these days. Stalwarts like NetNewsWire (my favourite) and Shrook, are sharing the aggregator pool with relative youngsters like Pulp Fiction. David Watanabe (who created the P2P app Acquisition) has released the very first public beta of ‘NewsFire’, an RSS reader that takes a slightly different approach. Rather than imitate the Apple Mail style interface, you get a single minimal metal window that makes it feel at home with Safari. It positively drips with OS X beauty – not just in the visual effects, but in the way the interface is pared down to the minimum. Its delightful to use. There are few things I’d like to see added, with the only change to the current set up to make the site name the larger headline (this is currently smaller grey text, while the most recent article is a large headline). It is still very much a beta (features/functionality not final) but its certainly stable. Its shallow, but I love the way that news feeds reorder themselves – the same effect used in iChat when buddies change status! Those of you who are registered users of Saft will now have the latest preview version with the new sidebar feature. The plugin nature of the sidebar (each panel can be a web page, perl script or shell script) has got me wondering about what useful little widget I could put in there. Here’s my first idea. After hacking the excellent Feedonfeeds news aggregator script, I’ve made a little OS X style RSS sidebar. Feedonfeeds is a php/MySQL solution that you can install on your site, rather than using a desktop client. From here I can click the unread number to view the latest feeds, the grey number to see all the recent entries, and the blog name to go straight to the site. The first 2 open in a simplified format – very like the RSS Reader/Sage extension for Firefox, and the upcoming Safari RSS reader. The advantage of a browser based, non-local solution is that its always up to date. I can access it from anywhere, and pick up where I left off. Downsides? Just one so far – It isn’t as good as NetNewsWire at detecting feeds. Where the XML has errors it just gives up. I’m giving it a trial for a while, I’m not sure yet whether it would replace NNW. After all, NNW 2 is going to be introducing a sync feature – great if you use more than one machine. If this looks like the kind of thing you’d like to use, let me know. If people are interested, I’ll clear it with the creator before uploading the additonal files to create the sidebar. Next, I think I might have a crack at creating a plugin similar to the Web Developer Extension for Mozilla and Firefox. That’s right. I’ve just received a new Saft beta, with the sidebar that I’ve been bellyaching about for months! To be honest, alhough I pestered Hao for this feature, I never really thought it would be possible, but hey, it never hurts to ask. Hao seems to like a challenge however, and he’s been kind enough to allow me to post screenshots here. This version works the same as other releases of Saft. The plug-in goes into the Library>InputMangers folder replacing the previous version. Once launched, Safari then has the ‘Show Sidebar’ command in the Safari menu (this is a temporary position). At the moment, once opened, there is no way to close it (this is a beta after all), but I get the feeling that I’ll probably leave it open most of the time. Thankfully, Hao decided on a Finder-style sidebar, rather than an OS X drawer. These always look a bit stuck on to me (although I’m warming to them more these days). As you can see, the sidebar sits underneath the tab bar, and its width is adjustable as you would expect. At the moment there are 4 ‘panels’ – bookmark searching, history, Versiontracker RSS and a google search. In the real release, Hao says that “one should be able to add RSS feeds, URL shortcuts like the one for Google, sidebars for local html files”. Superb! I had wondered whether downloads should go in there too, but as the recent builds of Shiira has shown, this could be a bit too cramped. At the moment, just the bookmark search doesn’t work. Each of the panel buttons toggle the content beneath it (click to show, click to hide). Scrollbars come in when this pushes content below the window. History is searchable, so although it only shows the last 12 places, as you type in the search field, the history is filtered. The prelimary RSS panel shows just Versiontracker posts for now, but this works just fine. With all of these panels, command-clicking links opens them in new tabs, as you would expect. Finally, the google search panel actually loads the google homepage in the sidebar, while search results are automatically opened in a new tab. This gives you a few more options than the toolbar google search, but I’m not sure I’d use this over the toolbar option. The beauty is, each of these panels is just a html page, which I’ve styled with CSS. Hao explains: “The extended parts of sidebars are really just a mini web page. For history, bookmarks and RSS feeds, there are html templates in Saft’s resources folder. You can just modify it to whatever you like. Also, in the same way as adding RSS feeds, I will add support for sidebar template in a way that user supplies a folder with a plist file, which points to a html file, URL or a script file that generate HTMLs, so you can add almost anything to the sidebar…”(!). Updated: Hao has done further work into the extensibility of the sidebar, and extra sidebar items can easily be added as .plugin files. As mentioned above. these can other web pages (local or remote – I’ve now got one set up for adding links to my textpattern setup), RSS feeds, and in the future – scripts such as perl or shell. So you can have whatever you want going on in there! The first application of this that I can see is a Safari version of the Firefox Web Developer Extension. Although not all would work in Safari, it would be an easy way to add a large folder of development bookmarklets to Safari. Thats all there is to say at the moment, except that I’m like a boy who’s just been told he can fly a real X-Wing Fighter. This has got real possibilities!